Mikhail Pletnev is an enigmatic conductor. Each time I have heard him in concert with his Russian National Orchestra he left quite a different impression than with his recordings. While in his discs he often sounds cold, underwhelming or merely eccentric, live I always found him a lot more exciting and even revelatory in the Russian repertoire. This time again, in a Munich concert, his traversal of Tchaikovsky’s Fifth was a gripping experience, offering remarkable musical insights and a sonority that convinced you he was really providing us a look into the composer’s soul. Or how ultra-familiar music can still surprise. Categories: Concert reviews | Tags: Alice Sara Ott, Gasteig, Khatia Buniatishvili, Marc Haegeman, München Musik, Mikhail Pletnev, Munich, Piotr Ilyitch Tchaikovsky, Russian National Orchestra | Permalink. Cancellations always carry their bit of disappointment. 84-year-old Lorin Maazel had to sit out all concerts with his Munich Philharmonic Orchestra in May due to illness; he was already replaced on the orchestra’s New York tour in April, but we are told the maestro is recovering. 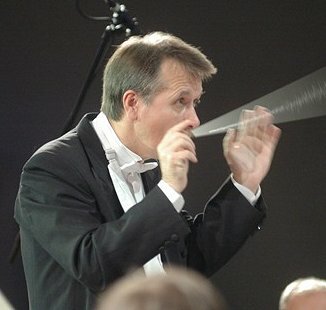 Enter Gustavo Gimeno, totally unknown as a conductor in the international arena. The 37-year-old Spanish-born principal percussionist of the Royal Concertgebouw Orchestra stepped in for his music director Mariss Jansons earlier this year and made a favorable impression in Amsterdam. Needless to say he has conducting experience and previously worked assisting old masters like Claudio Abbado and Bernard Haitink besides Jansons. Amsterdam clearly meant a huge break which put him on the map. Gimeno will soon quit playing percussion and devote himself full-time to conducting. Categories: Concert reviews | Tags: Claudio Abbado, Gasteig, Gustavo Gimeno, Khatia Buniatishvili, Lorin Maazel, Marc Haegeman, Mariss Jansons, München, Münchner Philharmoniker, Munich Philharmonic Orchestra, Philharmonie im Gasteig, Piotr Ilyitch Tchaikovsky, Richard Wagner, Romeo and Juliet | Permalink. The German city of Munich boasts no less than three symphony orchestras of international stature. Next to the Bavarian State Orchestra (the former Bavarian Court Orchestra, now the opera ensemble) and the Bavarian Radio Symphony Orchestra, it is however the Munich Philharmonic which is considered the true city orchestra. Founded in 1893, in recent times the Munich Philharmonic became mainly associated with Sergiu Celibidache, who was its influential general Music Director from 1979 until his death in 1996, and whose memory remains to this day very much alive – the legendary Romanian maestro even has a (smallish) square named after him next to the concert hall. As of 2012/13 Lorin Maazel will act as the orchestra’s Music Director. Categories: Concert reviews | Tags: Benjamin Britten, Edvard Grieg, Gasteig, Jean Sibelius, Khatia Buniatishvili, Lorin Maazel, Marc Haegeman, Münchner Philharmoniker, Munich, Munich Philharmonic Orchestra, Paavo Järvi, Philharmonie im Gasteig, Piano Concerto in A minor Op. 16, Sergiu Celibidache, Simple Symphony | Permalink.